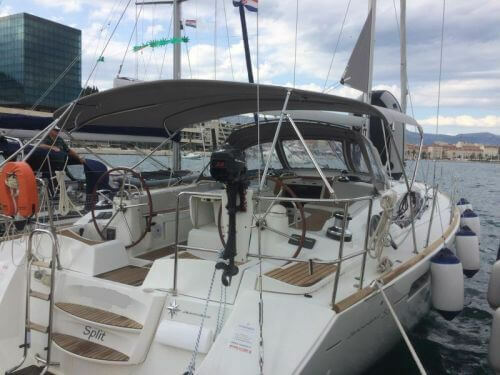 Looking to sail from Split? Search to find and book your ideal boat, or read everything you need to know: prevailing winds, where to sail, how to get there and more! 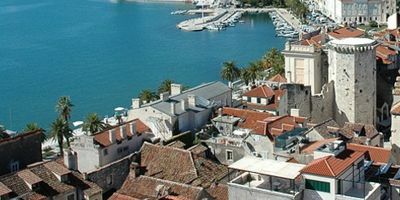 Split is a great place for a sailing holiday because it has glorious weather, reliable winds, great sailing infrastructure, and, of course, plenty of places to explore. From Split you can choose whether to visit the nearby castles of Kastela and the delightful UNESCO world heritage island-town of Trogir, or to head further afield to the islands which dot along the Croatian coast - the attractive Milna, the hill-top castle of Hvar, the carnival atmosphere of Paklinski Otoci, the fortifications of Vis, the argiculture of Maslinica, and the natural beauty of the blue cave at Bisevo, amongst many others. With so much to see and experience, it's no wonder that this is the most popular sailing area in Croatia - and whether you're chartering with a skipper or bareboat, on a Yacht or a Catamaran, we can find you a great option, with 5-star Customer Service as standard! You are spoilt for choice when sailing from Split, with so many options available that it can be difficult to choose - Brac, Hvar and Trogir are all well worth a visit as well as Paklinski Otoci, and the astonishing Blue Cave. The castle of this medieval town offers spectacular views over the whole surrounding area, and the town itself is known for its picturesque narrow streets, lively nightlife and fine dining. Perfect! A hidden gem in the Med, and one that only sailors can reach – there’s a collection of bars and restaurants located in a small bay on an island in the middle of nowhere! There’s a special atmosphere here. A phenomenal cave which is full of sparkling luminescent neon blue water that looks amazing, but mind-boggling! The easiest way to see it is to take turns to helm the ship, as there is nowhere to moor up nearby. Our 6-day itinerary takes in the best parts of the cruising area, from natural wonders like the blue cave in Bisevo to the equally beautiful and impressive town of Hvar, the sailors paradise of Paklinski Otoci, plus cute fishing villages galore. 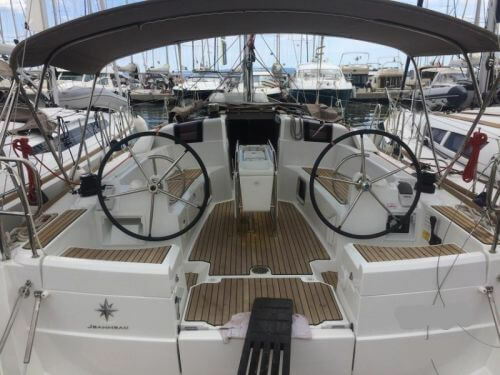 In total, it clocks in at 107 nM across the week, which, at an average speed of 4-5 knots, means sailing for around 4-6 hours a day, giving you time to take breaks in bays or beaches as you pass them, to explore your start or end-points a little deeper, or just to take your time doing the shopping. 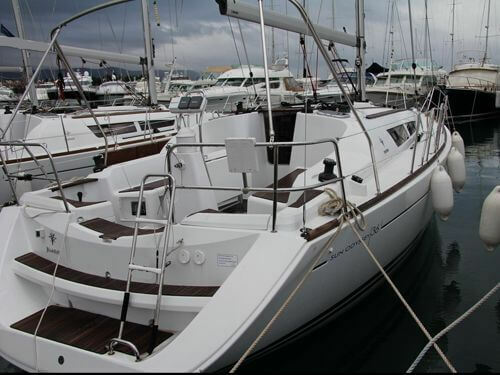 It’s only a 6-day itinerary because usually after checking in to the yacht, you often won’t have much time to do a meaningful sail, and it finishes in Split on the Friday night because that’s when you’ll need to get your yacht returned to the marina by, so that the yacht can be inspected (but you’ll still sleep on it for the night). Stow the cups and saucers, batten down the hatches, forget that people are watching you as you perform your first manoeuvre to get out of the marina, and let’s get out there and get the sails up! The first day is fairly straight forward as you’ll basically be heading due South to the first island you see once you’re beyond the mainland. You’ll be beating up and tacking against the prevailing wind as you head towards Milna, a small and charming old fishing village on the island of Brac where we’re headed for the night. Milna was once a key part of the Venetian empire, and much of its fine architecture (including an impressive clock tower) dates back to the 16th century. The town itself has narrow streets, and there is a reasonable choice of places to eat or drink. On the second day, we're heading in the same direction of due South (with a few kinks here and there), which means you’ll still be sailing upwind close-hauled and/or beating your way along in the prevailing wind as you hop South to Hvar before nudging East and then weaving through the islands to get to one of our favourite places to stay in the whole of the Med: Paklinski Otoci. This place is a bay which is only accessible by yacht, but which has an incredible six bars and restaurants alongside a fantastic beach. It’s a great place to play, relax, eat, drink and mingle with other sailors, and there’s a couple of bars which do some amazing cocktails! If there’s no space in the bay (it can get full quite quickly in peak season), then you can moor up in nearby Palmezana (on the other side of the island) and walk across, but it’s not quite the same, and you don’t get the same atmosphere of being central to the action. If bars are your thing, there’s another small unnamed bay which has two bars in (but no roads) - you'll find it on the part of the south coast of Hvar island which you pass on the way down today, and it’s well worth stopping there for lunch, a swim, or a drink. After a fishing village and a carnival atmosphere, our next port of call is a natural wonder – the blue cave of Bisevo. At 37nm, this is the longest day of sailing, though there are a couple of get-outs if you aren’t making as much way as you’d like, and if you prefer not to visit the cave, the actual distance between Paklinski Otoci and Vis is only about 10 nM. From Paklinski Otoci, you’re bearing South-west to the top of the nearest island (which you should be able to see on the horizion), reaching across the prevailing wind. When you’re passing Vis, you can make a call as to whether to head round to Bisevo, where there’s a cave which, thanks to a natural light phenomenon, seems to be full of brilliant blue neon water. It’s a crazy place to see, and even crazier to swim in. The easiest way to see the cave is by dinghy, and since there’s nowhere to moor up, you’re better splitting up into two groups so that you can leave someone at the helm to keep the yacht out of any trouble whilst the other group visit the cave, then switching over. There is an entrance fee to be paid to the guy at the cave, and don’t forget to take some pictures to show your friends (the lighting effect can be captured well enough on a camera). After visiting the cave, head North-east to follow the South coast of the island back around to Vis (or there is an option to stop in Rukovac bay if you’re pushed for time and the wind is blowing in the right direction). Vis has been a town since around 4 BC, when it was founded by the Greeks, and it has since been under the rule of most of the major empires – including the Romans, Byzantine, Venetians, Ottomans, the Austro-Hungarians, French, and even the British empires (indeed, there is even a British war cemetery). Keep your eye out for a local species of palm tree that grows only on Vis. After a long day at sea, the trip to the next destination, Hvar, is just a short 13 nM hop to the North-west. This change of direction marks the mid-point of the week, and also means that you should have the wind behind you as you make your way back past Paklinski Otoci and onwards to Hvar. If you have your binoculars out, you should be able to spot Hvar castle (on the top of the hill, above Hvar town) from some distance. It’s an impressive place to visit when you arrive on land, and totally worth the 30 minute hike up the hillside - the panoramic view from the top of the hill is simply outstanding. If there’s no space in Hvar, you could moor up in Palmezana, across the water from Hvar, and grab a water taxi to Hvar from the marina. Once famous for being a party town, Hvar has calmed down a little, but it still has a good reputation for lively nightlife, coupled with some of the finest restaurants in the whole of Croatia, and a picturesque old town (if you have a camera-enthusiast in your crew, then double the time it will take to walk to the castle). Hvar is only a small town, but it will feel like a city compared to our next port of call. Maslinica has won awards for being the best tourist spot in the Med with fewer than 1,000 inhabitants – thanks mainly to its fine beaches, pine tree forests and general unspoilt beauty. It’s also famous for the quality of its local produce, and is widely regarded to have the tastiest honey, the best schnapps, and the fruitiest wine in the whole of Croatia. All are certainly worth sampling. From Hvar, you’ll get the chance to try the sails heading in a North-western direction, which should see you reaching across the prevailing wind. It’s a long stint on this bearing, which means it should be a good time for reading or sun-bathing, assuming the waves aren’t too big (and they shouldn't be). Interestingly, Maslinica began life as a holiday retreat for some rich aristocrats – such was their wealth that they built their own castle to prevent being attacked by pirates! Disappointingly, this is the final day of the itinerary, and you’ll end up back in Split by 5pm, when you’ll need to check the boat back in for an inspection, with a full tank of fuel. But that doesn’t mean that you can’t have fun and enjoy the last few hours of sun, sea and sailing in style. The sailing time from Maslinica to Split is 2-3 hours, so you have time to check out some of the beaches and bays around Solta island before bearing North-east, reaching with the wind behind you and with Split on your bow. You'll need to head to the fuelling station in the main harbour in Split (where you'll likely find a queue of other charter boats) before returning the boat back to where you picked it up from. 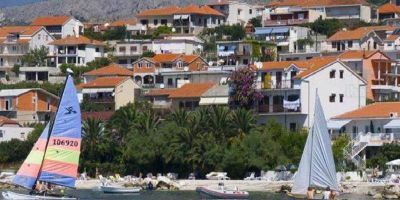 You’ll still be on the boat for one last night, and are just a short walk from Split Old Town, where there’s a strip of bars along the waterfront, a fantastic range of eateries, and even a nightclub. The whole place will be full of sailors on their last night (just like you), as well as the usual tourists, who probably wouldn't even know what a fender was!? 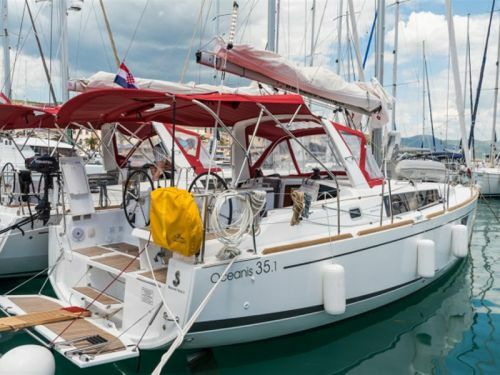 Hopefully you will’ve had a brilliant week on your yacht or catamaran, and you will’ve learnt new things, made (better) friends, and enjoyed everything that Croatia has to offer. When you’re home, you can start to plan your next voyage with PlainSailing.com – there’s hundreds more islands in Croatia and Greece, plus Italy, France and Montenegro that are just waiting for you! As you would expect being a little further north than Greece, Croatia is a little colder throughout the year. Whilst Greece has mild winters, Split is close enough to the alps for cold winds to bring temperatures right down to 5 or 6 degrees. 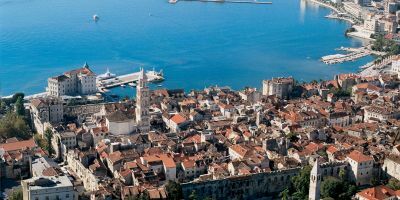 Conversely, whilst Greece can see stifling temperatures of up to 40 degrees during the summer, the temperatures in Split are a lot more pleasant, and seldom push the mercury beyond the mid-thirties. 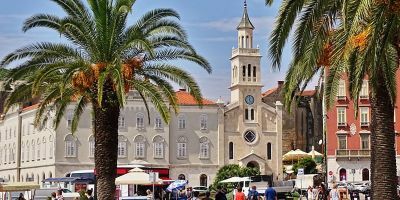 The sunshine in Croatia is pretty much guaranteed from May to September, and, coupled with pretty reliable winds, it’s no wonder Croatia is gaining so much popularity as a cruising destination. 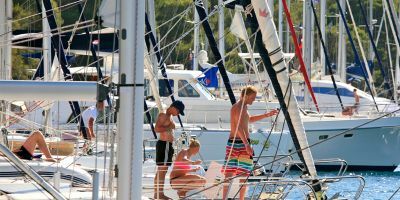 Just as the air temperature warms up to perfection for the sailing season, so too does the sea temperature – with the water hitting 25 degrees at the peak of the sailing season, making it the ideal temperature for throwing down the anchor and diving in. Less enticing, perhaps, is the sea temperature from October to May, when 15 degrees will feel about as comfortable as a cold bath. Winds in the area around Split are remarkably reliable, and at the height of the season, it’s almost possible to tell the time from them. There’s a morning wind from 9am to mid-day, which will allow you to get the sails up as soon as you leave the marina, followed by a period of eerie silence (local sailors say that the wind is having it’s lunch), before returning stronger after 2pm until sunset. This does give you a good opportunity to spoil youselves at lunch-time, with quick stop-overs at restaurants in towns, or in beautiful bays very much the order of the day! In the summer, the prevailing wind is landward in the afternoon – the sun heats the land, which causes the air above it to rise, which, in turn, pulls wind across the sea. The wind can be anywhere from Force 3 to Force 6 during the day, but disappears to a light breeze in the evenings. Outside of the sailing season, the winds are a lot less predictable, and can arrive as cold winds from the mountains, storms from the equator, or pretty much anything in between. However, the fact that there is no prevailing wind means that most weather systems pass on after a couple of days or so. What is the Current Weather in Split? Split is a remarkable city. It has been a city of strategic importance for centuries – dating back to the Roman empire. Since then, it has been part of Venetian, Napoleonic, Greek, German and Yugoslavian control, before Croatia gained independence in the 1990’s. Each ruling party have left their own mark on the city – though it is perhaps the fabulous and outstandingly preserved Roman Palace of Diocletian which the city is most famous for. 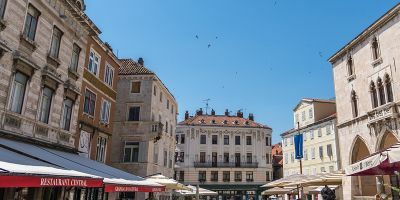 Split is choc-full of monuments and buildings of bygone times, which gives the town an antique feel, and makes it the perfect place to enjoy a stroll with an ice-cream during the day, or to sit in a lively bar as the sun sets. Split is also blessed with multiple great beaches, and a coastal walk would be well worth the effort were it not for the fact that the city itself is so impressive. 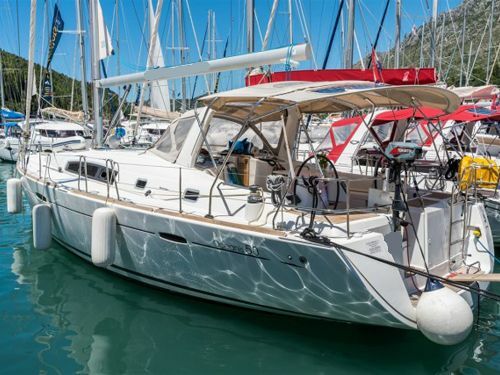 Real fans of boats might like to head to the Croatia Boat Show in mid-April, which features the latest models of some yachts, as well as a myriad of boat related events. In May, there’s the International flower fair, when the whole of the city blooms, and there’s a huge flower market in Diocletian’s palace. And if you’re there on the 7th, then you’ll witness the St Duje’s day parades, as people take to the streets in traditional dress, and they cook and share a massive risotto! June sees the start of the Splitski Festival which is a festival of popular music, with performances by the great and good of Croatian pop music. This rolls into the Split Summer Festival which runs through July and August and showcases classical and folk music, as well as other performance art. Music-wise, there’s also 3-day Ultra Europe Festival for fans of electronic music. 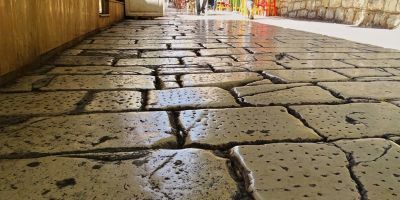 The Roman heritage of Split is celebrated at the end of August, when there is a ‘Days of Diocletian’ festival, when there is a re-run of an old Roman parade through the streets, and the town is full of people in Roman fancy dress. And later in the year, there’s the Split Film Festival in mid-October. Enero Sea View *** - c. £45/ night for a double room with a shared bathroom, but a triple room is an option, or there is an 8-person apartment. This guest-house is super-close to the marina, whilst only being a short walk from the old town, and offers great views of the sea. Hotel Consul *** - c. £80/night for a double room, or a four adult room is available, A very well run hotel, just outside the old town, and where you’ll be able to get a good nights sleep and a decent breakfast. Hotel Bellevue *** – c. £100/night for a double room – if you’re all about location, this one is in the heart of Split old town, where all the action happens. Continental breakfast and wifi are included. 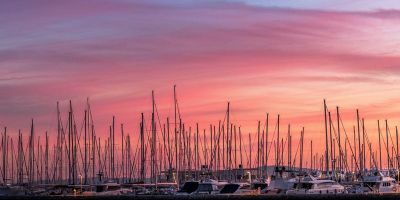 The ACI marina in Split is well located for both exploring the town to city of Split (which is just a few minutes’ walk away), and for enjoying the sunshine on a perfectly maintained local beach (which is even closer). Even with 318 berths, the marina can be rammed in the peak season (July/August), so get here early if you don’t have a reserved space (but if you’ve chartered from here, don’t worry – just take it back to where you found it). Marina facilities are reasonable, with everything you need on hand. If you can’t face heading into the city, the marina bar is a nice place to relax, and can get busy on Friday and Saturday nights. The nearest supermarket is the Spar supermarket about 200m from the marina on Spinčićeva ul. 2j, 21000, Split, or there is a Victa hypermarket around the corner on Poljička cesta, 21000, Split which is open later. 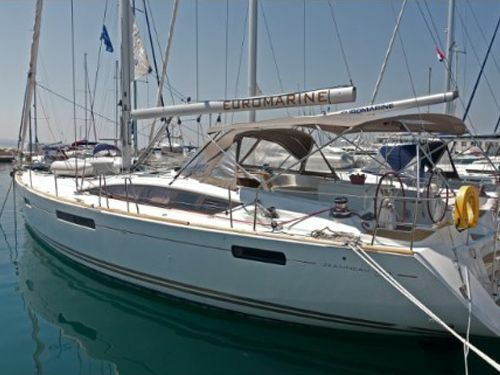 Split Marina is very easily accessible from Split airport, which is about 25km or 30 minute car drive away. Transfers can usually be arranged reasonably cheaply (check out our blog on Transfer Fees), or there is a car park at the Marina if you're driving. There are buses that go every hour into the centre of Split from the airport, which is just a short 400m walk through the centre of the Old Town to the marina.